I love tortillas. I use them in place of bread, as a treat topped with almond butter and apples or bananas, or toasted with some ghee and garlic to make a pretty great garlic bread alternative. And since I’ve tasted so many kinds, I can save you some time and tell you these are by far my absolute favorite. Our son loves them and we’ve been known to top them with nut butter and fruit and roll into a crepe, or toast them and use them as a base for a Paleo pizza. So many options folks – trust me on this one! Mix all ingredients in a large glass bowl. Place a strip of all natural wax paper on your counter. Divide dough and roll it into a ball with your hands (ball should fit into the center of your palm). Place the piece of dough in the center of the wax paper and place another strip of wax paper over the dough ball. Use a rolling pin to roll out the dough until it is as thin as you can get it without it falling apart. Place tortilla onto pan and let it cook for 1-2 minutes, or until golden brown (the edges will brown and the middle will start to bubble). Flip and cook on the other side for another minute or less. Add more coconut oil as the skillet becomes dry and lower the temperature to medium-low to prevent burning if needed. 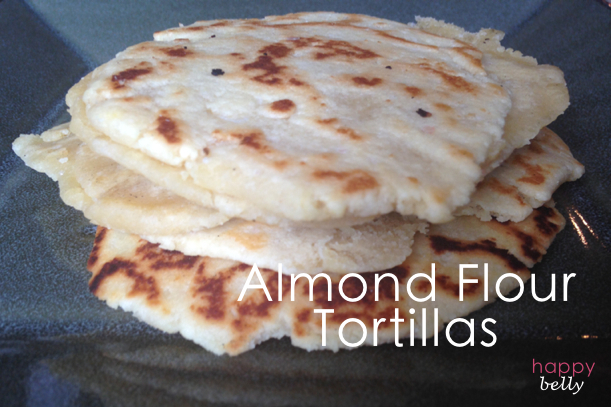 Tortillas will store in the freezer once cooled or can be kept them in the fridge in a glass container for a few days. To reheat, simply warm a cast iron skillet on low to medium heat and place on skillet for 30 seconds per side. « Austin-based Ice Cream Lovers, Nadamoo! needs your votes! Looks so cool, I’m going home to try!